I have made it a point to be at the National Graduates’ Orientation Programme each year since the age of 21. I am 38 this year, so I have had the privilege of speaking to graduates for many years now, and this opportunity is very precious to me. I have very limited time today to speak to you- I have a flight to Delhi immediately after this. As you may know, the former Prime Minister of India, Shri Atal Bihari Vajpayee has passed away. He has been a cherished friend of Bhutan, and I would like to attend his funeral and pay my last respects. I am unable to spend time with you on the final day of the National Graduates’ Orientation Program as planned originally. Nevertheless, I did not want to miss the opportunity to speak to you– so I am glad that we managed to arrange this brief time together before I leave. I want to say a few things to you that I have said in the past to your predecessors as well: As a nation, it is very important for us to learn our past in order to better understand our present, and get a clearer picture of where we are headed in the future. There are many significant aspects of our history from which to draw lessons from, since the time of Guru Rinpoche, but I will focus on our more recent past for today. If you look back at 1961, that was when we started our first Five Year Plan. It was a mere 57 years ago, yet we have come so far and achieved so much. We have strengthened our sovereignty as a nation, we remain united and peaceful, we have made astounding progress in development, and we have always prioritized the well being and welfare of our people. As a result, we have been able to establish democracy, and our success so far is due to the very strong foundations upon which this nation has been built. First of all, there is the quintessential Bhutanese value of tha-damtsi, or integrity. We were able to succeed in our purpose because of the integrity of the Bhutanese people, and our commitment to serve the people and achieve all our national goals. Secondly, we shouldered all our responsibilities with solemnity– we did not ignore or consider less important certain aspects of our work, but carried it all out to the best of our capabilities. Thirdly, we were intently aware of the ramifications of our work, and knew that failure could never be an option for a small country like ours. Our foundations have been strong because we were mindful of the weight of our responsibilities. A few months ago, I met with a visitor to Bhutan, who appreciated the way we have managed to preserve our cultural heritage. He wanted to know what I considered the most important aspect of our cultural values. A value that I would want the youth of today, who are well educated and well-informed about the world at large, to inherit and pass on to our future generations. There are many aspects of our culture that are important, but it is very clear to me that above all, the younger generation should possess the sensibility that sets apart the Bhutanese. 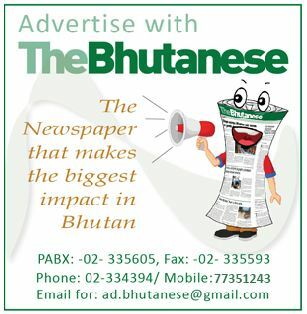 Bhutanese are inherently sensible people, a quality that has emerged from the way we think and act. Back in the 70’s, we began getting the first tourists to Bhutan. 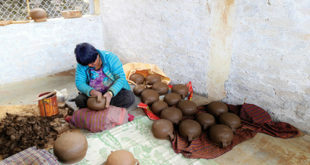 Many people told us that Bhutan was an extraordinary country, that it would be a sought after destination, and that we should open our doors by encouraging as many people to visit as possible. It would make us a lot of money. But we decided to take things slowly, and came up with the idea of high value, low impact tourism. During Drugyal Zhipa’s time, when we did not receive more than a 100 tourists a year, it seemed like an absurd idea. But today we understand that the policy was farsighted, and the decision was profound. This is what I mean when I say that we are sensible people. Look at the environment policy of Bhutan. Today, our Constitution mandates us to safeguard our environment, and we have managed to protect vast areas of land as national parks. But during the 1950’s, when conservation was not even a global issue, and we were inundated with advice to cash in on our forest resources, we chose to consider the future instead. We made strong laws to ensure that we would be able to pass on our wealth of natural resources to the future generations. It is the same story with our culture. In the 70’s and 80’s, a lot of young people received western education, and many of them were schooled abroad. There was a sense of gravitating to the west, and there was a lot of enthusiasm for everything foreign to us. 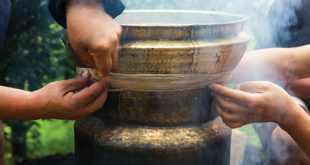 But it also meant that there was a risk of replacing our own way of life with an imitation of western practices. When policies were enacted to protect Bhutanese culture and driglam, we received quite a lot of flak from outside, and even complaints from the youth themselves. But today we are recognised and appreciated for having preserved our uniqueness, which sets us apart from our gigantic, populous neighbours. Our unique cultural heritage forms part of our national identity. We knew not to be swayed by short-term objectives, and followed our own sense of providence. We knew exactly what we were doing and what it was all meant for, because we are our own experts. Our actions were born out of a sense of loyalty to our country and it’s future, and we knew very well what was the best course of action. Today, there is a similar situation with hydropower. The potential of hydropower in Bhutan is well known, and we are told that by exploiting this resource to its fullest, by privatizing it and allowing foreign companies to set up huge projects, we will be able to make enormous amounts of money. But there are huge implications of heading in that direction. Hydropower is our national wealth, and before putting it in the hands of a few, we must think about the welfare of our people, about the evils of corruption, and the economic disparity that will result. When I became King in 2006, we were working on our Constitution, and one of the criticisms we received was over the requirement for our Members of Parliament to have a university degree. We were told that such a requirement was undemocratic, and dampened the euphoric mood of the time, when we were all working towards a momentous change. But our elected representatives in the Parliament are the drivers of our nation. Would you trust a bus driver taking your children to school, if such a person did not have the adequate training and credentials to do their job? We are placing our country’s future in the hands of our elected representatives, and we had to ensure that they were well qualified for it. Today people praise us for our highly educated MPs. Close to 70 percent of our MPs have Masters Degrees. Our opposition leader has a PhD, our PM went to Harvard, our former NC Chair is an intellectual in his own right. Our parliament in the last 10 years has been impressive. So time and time again, we have found that our sense of providence enables us to succeed. We know our country, we are committed to our responsibility to the nation, and we know what we must do. We are sensible people, and this is a value we must ensure lives on. Anyway, to move on to the present- we have certainly come a long way. In 1961, our national budget for the first FYP was 107 million. This is the average budget today for one bridge. Compare this with 224 billion for the 11th FYP. The 12th FYP budget is estimated to be more than 300 billion. When I was born, in 1980, the 5th FYP was ongoing, and our GDP that year was 1 billion, as compared to over 148 billion expected this year, in a span of 38 years. We have done extremely well in such a short time. We have been able to build very strong foundations for our country. But with changing times, we are faced with new opportunities as well as new risks. As we look to the future, I want to impress upon you three words that come to my mind- Evolve, Adapt, and Upgrade. We are still left with tremendous work to do in various areas– finance and economy, private sector development, education, national human resource development, governance, etc. Other countries may be able to get by with average performances. But we are a small country, and for us, average spells disaster. Our future cannot be average; the capabilities of our youth cannot be average. We have to strive for strength and greatness, and the average trap will be our biggest obstacle. Every step of the way, each and every single year, we have to evolve, adapt, and upgrade. Let me end with 3 more points– this is something I have spoken of many times before, so you may have heard it, but I would like to repeat it because I consider it important. We are the guardians of our sovereignty and security, our peace and unity. I know that our under-15 girls football team are playing a tournament, so let me give you a football analogy. Think about a very skilled football team, with the best striker, the best midfielders and defense, with the best goalkeeper. A superbly talented group of players. Now imagine that one day, because their next match is against a weaker team, they decide to take it easy, decide to go out, have some drinks, get into a fight, and injure and hurt each other. Do you think this team will be able to win? They won’t, even if their opponent is actually less skilled. It’s the same for our country- we will only be stronger as a team if we work together. We are unlike any other country, we are small, and only in our unity will we find strength. We are also the custodians of national identity. 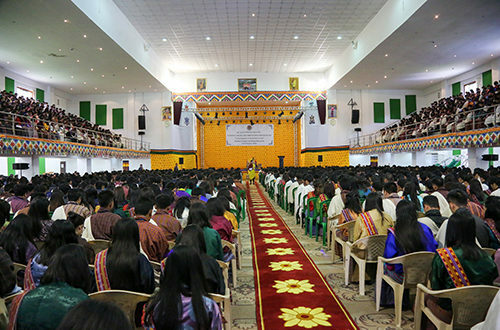 Differences in our ethnicity, religious beliefs, regional and economic backgrounds must never be allowed to divide us– we must be able to always have a common Bhutanese identity that transcends all differences. There is no other country in the world exactly like Bhutan– we are unique in the world, we have a unique identity, and we have to ensure that we look after it. Finally, it is your capabilities that will shape our collective future. What we lack in numbers, we must make up with talent, disposition towards hard work and a strong sense of duty. As you know, we can never compete in terms of sheer numbers with others- China has 1.5 million engineers, India has 1 million. Consider that. The only way we can compete is with our capabilities. That is why, you, the graduates of NGOP 2018, owe it to yourselves, to your country, and to our future, to keep learning. Now that you have completed your formal education and have entered the workforce, this is not the end of the road. Our century is going to be full of change, and what works today will no longer do so tomorrow. What is relevant today will be redundant tomorrow. New discoveries and technology is constantly changing the way we live, work, and conduct business. So you have to work hard, and prioritize intelligence and capability. The road ahead of us in our life will not be easy. You have to rise to the occasion. Once again, I am glad to be here– I was afraid I would not be able to make it this year, so its wonderful that we managed it. I wanted this opportunity to speak to you here because you are important. You are over 2,000 university graduates– you are our wealth, and you have worked hard to get here. Going forward, we are going to grow old together, and move into the future as one family. We are all on the same path, our goals, objectives and dreams, and our future are the same, and we have to work together for it. Let’s hope that wherever we reach is a good place. Not a single comment from anyone.This is not a good thing, put your views here.His majesty’s has delivered a nice view to the youth of Bhutan.Appreciate it.By the love from India.